Today was a snow day, so in between work emails, I went upstairs and played with my stash. I have a huge stash of stuff. Card stock, patterned paper, and more. I am sure I have told you about my obsession with die cuts, Stampin’ Up, and Project Life cards. I love them all. I buy new and used Stampin’ Up, much to my husband’s consternation. I must have a couple of hundred stamp sets. Many of which I haven’t used yet. I used watercolor pencils for the car. I loved the little puff of smoke with this stamp set. It reminded me of my first car. These little love birds are precious! Now I need to find a few stamps and send them off to family and friends. Happy Tuesday to all! After a stressful week at work that culminated in hosting our company retiree dinner with 170 attendees, I finally had time to try out my new paints. I watched a few YouTube videos so I could see what I was supposed to. I don’t usually do too much research, I usually jump right in. So that’s what I did. I am not so good at using different media and getting a really put together look, but I think I might get better with practice (a lot of practice). I started with the dylusional paints I bought last week. 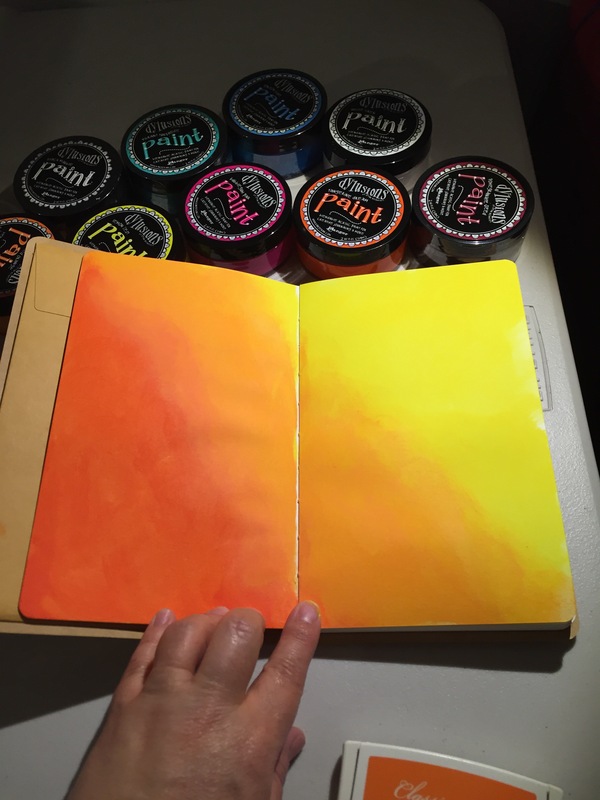 I wanted to start with a lighter color so I used the lemon zest yellow, tangerine dream and orange. I dug out a set of baby calendar stamps from Close to My Heart and stamped the month of May on the top right of the page with Tangerine Twist ink from Stampin Up! 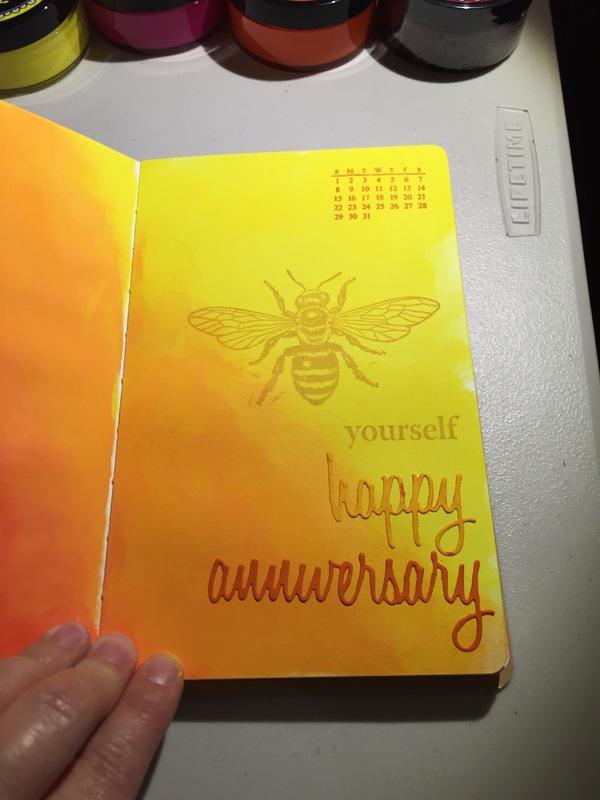 Then I added a beautiful bee stamped with More than Mustard ink (I think that is the color) also from Stampin Up!, with the word yourself underneath, be yourself. I added the words happy anniversary at the bottom because my husband and I are celebrating our 20th anniversary this month. I know it really doesn’t go together that well, but it is my first try. 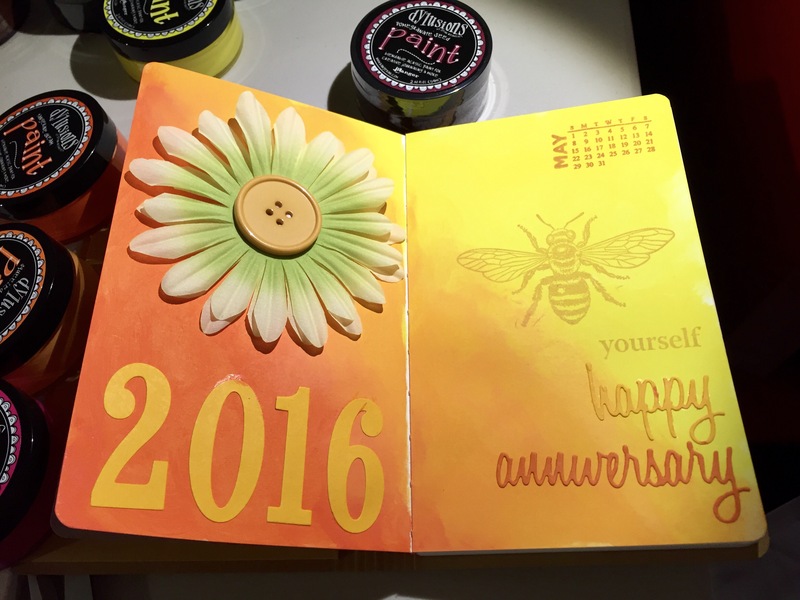 I finished the layout with the year 2016 with die cuts from Stampin Up! And a pretty flower with a button center. I had fun playing with my stash of stamps and embellishments an am looking forward to getting better at this craft. I can see I need to work on this 😜..